THE COUNTRY is hurtling at full speed into an economic and social catastrophe. Some claim there could be 500,000 unemployed by the end of the year. Workers and their families at companies such as Celestica, IBM, Boston Scientific, and many many others are reeling from the shock of thousands of job losses. 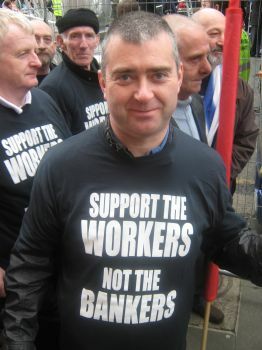 Don’t Bail out the Banks – Use bank profits to “bail out” society! THE DECISION by the government to nationalise Anglo Irish Bank and now recapitalise AIB and Bank of Ireland (BOI) to the tune of €7 billion of tax-payers’ money is an attempt to shore up the Irish banking system. All Irish banks are on very shaky ground. IN A report published in January, plans were announced to effectively close the casualty departments in Ennis, Nenagh and St. John's (Limerick) hospitals, replacing them with nurse-led minor injury units, unable to treat emergencies. Unemployment heads towards 500,000 – Demand jobs not dole! JANUARY 2009 saw the worst ever increase in unemployment. Those signing on to the live register rose by 36,500 to a total of 327,900. Brian Cowen has admitted that unemployment could reach 400,000 by the end of the year, but if it continues at that rate it could pass the half a million mark by the end of 2009. Fighting the pay cut: McLoone makes no impact! THE RESPONSE of the IMPACT leaders to the attack by the government on the wages of public sector workers has demonstrated bankruptcy at the heart of the leadership. THE ANNOUNCEMENT of a “pension levy" on public sector workers has been met with a wave of anger by civil service and public sector workers. The reality for public sector workers the majority of whom earn €35,000 per annum or less, is that far from being overpaid, they are already struggling. To quote David Begg, the difference this levy will make to these workers is "the difference between existing and not existing". A MONTH after announcing 1,900 redundancies in Limerick, Dell has been forced to make important concessions to workers. Workers have succeeded in forcing the company to provide a better redundancy package, increasing the cap from 52 to 104 weeks pay and improving the pay rates in the package, which previously covered only basic pay. Derek, an unemployed electrician spoke to the Socialist about the difficulties he has encountered “signing on”. SHOCK, ANGER and disbelief probably best describe the feelings of Dublin Bus workers at the announcement that 290 workers are to be sacked over the next while. Along with the job losses, over 120 buses, nearly ten per cent of the fleet, are to be axed. On top of this, the company is refusing to pay the increases due under the last partnership deal. Bus Eireann are using similar arguments to sack 300 workers.